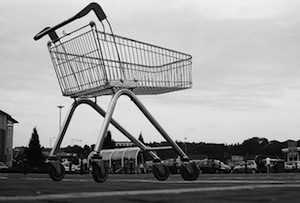 Tesco is suffering the most but Asda, Morrisons and Sainsbury's are all feeling the pain. The British grocery sector is in decline for the first time since records began in 1994 as the 'Big Four' supermarkets wage an aggressive price war against their discount competitors. Figures from Kantar Worldpanel show that sales across the industry fell by 0.2% in the last three months compared to the same time last year. Tesco unsurprisingly fared the worst, with sales falling 3.7% and market share falling from 29.8% to 28.7%. The rest of the Big Four are also struggling although Asda performed the best, with sales falling in line with the rest of the industry and a steady market share. The march of the German discounters continues. Aldi sales were up by 25.5% and its smaller cousin Lidl posted more modest growth of 16.8%, which brings their combined market share to 8.4%. Waitrose’s quiet success continued at the other end of the market – sales were up 5.6% and its market share increased from 4.8% to 5.1%. The figures pour more gloom on the big supermarkets a day after City figures warned they will need to close one in five stores if they want to return to profitable growth. A Goldman Sachs analysts' report said price cuts could only do so much to ward off the discounters and earnings at Morrisons, Sainsbury’s and Tesco could fall as much as 60% between 2013 and 2017. The three listed supermarkets, Morrisons, Tesco and Sainsbury’s, have all reported falling profits in recent weeks while Walmart-owned Asda has cut its profit forecast. Things are certainly looking bleak for the Big Four.